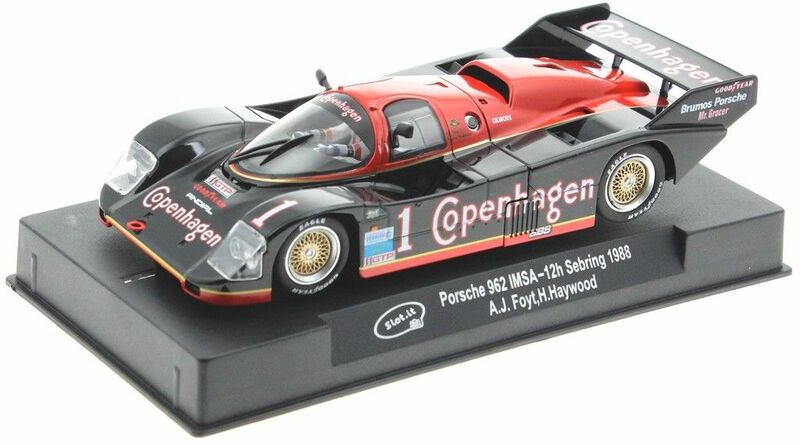 The Porsche 962 is a sport-prototype racing car created to replace the already successful Porsche 956, in order to allow it to race the IMSA and WSC Group C competitions. It was one of the most successful racing cars ever and it won several competitions all over the world: - World Sport-Prototype Championship in 1985 and 1986 - 24h Le Mans in 1986, 1987 and 1994 - IMSA GTP Championship in 1985, 1986, 1987 and 1988 - 24h Daytona in 1985, 1986, 1987, 1989 and 1991 - 12h Sebring in 1985, 1986, 1987 and 1988 The IMSA 'GTP' regulations required some modifications in comparison with Porsches designed for the Group C.
Front axle was shifted 12 centimetres ahead, so that driver's feet could stay behind the hubs of the wheels. The boxer 6 cylinders engine had a displacement of 3.2 litres, was air-cooled, with only one turbo, 2 valves per cylinder and one single overhead camshaft. This car, driven by A.J. Foyt and Hurley Haywood, entered the 1998 edition of the 12 hours of Sebring.